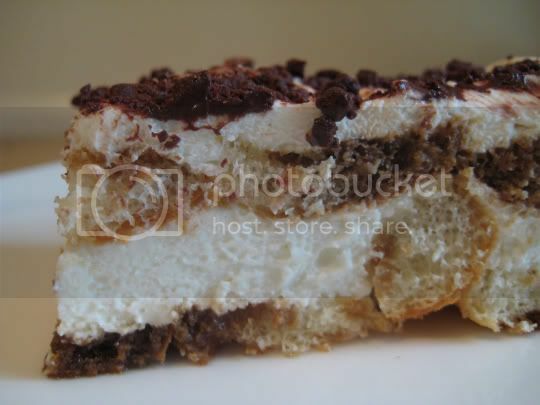 This is your classic "Americanized" version of the Italian dessert tiramisu...Americanized by the use of cream cheese instead of mascarpone for the filling. Still, this was just as good as any restaurant version, and certainly just as rich. After about three bites, I had to force myself to finish the rest. The Betty Crocker recipe does offer a "lighter" version, using low-fat cream cheese and whipped topping (read: Cool Whip) instead of the full-fat heavy whipping cream. I did use light cream cheese, but that's it. In my opinion, there is absolutely no way whipped topping can stand in for the thick, creamy texture and fresh, light taste of real whipped cream. I also used real rum, not rum extract, and espresso (made from instant espresso powder, a great baking ingredient that really brings out chocolate flavors) instead of regular coffee. I increased the cocoa powder for the top of the dessert from 2 teaspoons to about 3. Two just didn't look like enough. After about 6 hours in the fridge, this was ready to go. I docked one "strawberry" for this recipe's rating only because of the cream cheese quality: I used the generic store brand, when I DEFINITELY should have stuck with tried-and-true Philadelphia. I could without a doubt tell the difference in taste. Make again? Yes, great for a crowd. Leftovers weren't bad either. MmMm, I had a sample and it was MmMm MMmm good. I mean campbell soup like.